One of the brightest LED UV Black Lights on the market. 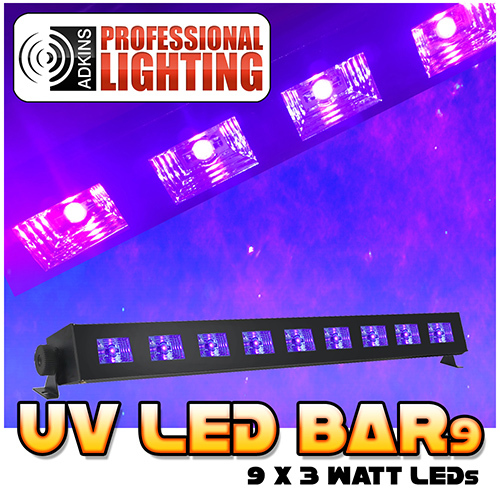 An impressive 27 watts of ultraviolet light emits from this 18.5 inch long UV light fixture. Great for Black Light Parties, Bounce Houses, Roller Rinks, Black Light Bowling, Bars, Night Clubs, Theater and Stage effects and even Halloween Decorations. 9x3watt LEDs - Runs on 110 volt or 220 volt. 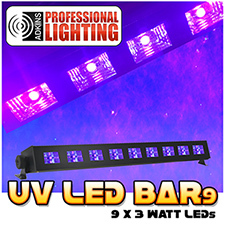 An awesome 27 watts of ultraviolet light emits from this 18.5 inch long UV light fixture. 9x3watt LEDs - Runs on 110 volt or 220 volt. 18x3watt LEDs - Runs on 110 volt or 220 volt.